Tony Taylor, Coordinator of the IDYW Campaign has been invited to be the keynote speaker at the Queensland Youth Affairs conference to be held in Brisbane, August 20/21, 2014. This invitation is a tribute to the impact of our Campaign, to the efforts of our supporters, over the last five years. It illustrates that, whilst our perspective is derided as out-of-date by those infatuated in the UK with targets and outcomes, the opposite is true. Our desire to defend youth work as a distinctive practice resonates with workers, researchers and academics across the globe – in Europe, in the United States and, clearly, Australia. 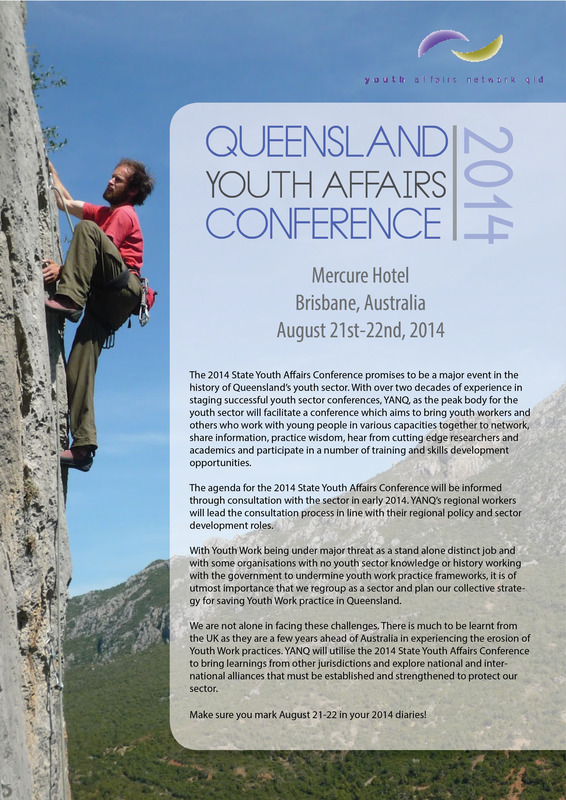 In the coming weeks we will post a number of the conference ‘call-outs’ being produced by the organisers at the Youth Affairs Network Queensland. These will be invaluable in illuminating our understanding of the Australian scene, in underlining that we face a common enemy, even if that foe appears in many different guises.